Let’s go nuts at Christmas! Christmas is just round the corner and I wonder if you like me, are starting to think about and stock up on the festive nibbles. This time of year we dig out the nut crackers and battle with Brazil nuts and the oh so impossible to crack almonds, for this almost painful tradition! Although Christmas is a time for giving, it is also a time for sharing and over-indulging a little. Yet please be reassured that nuts (in their natural state) are highly nutritious and we should look to include them in our diet every month of the year, not just December! So here is the low-down on the 10 most popular nuts; which contain the most healthy and unhealthy fats, which are most calorific and what’s the best way to eat them. All nuts are pretty high in fat (regardless of whether we are talking about healthy or unhealthy fat) so they can add to our waist line if eaten in excess – less is more when it comes to nuts as nibbles but they can be a much better choice than crisps and other savoury snacks. Nuts are packed full of protein, fibre, heart healthy fats, vitamins and minerals. A small handful (30g, which is about the size of a golf ball) is a great, nutritious snack that will fill a gap between meals. Frequent consumption of nuts is associated with favorable changes in blood cholesterol levels and a reduced risk of heart disease so sprinkle a few on your cereal or yoghurt in the morning or add them to stir-fries and desserts. Which ever nuts you go for, choose unsalted varieties and those preferably still with their skins on as these contain even more beneficial nutrients.The good thing about this time of year is you can easily buy all sorts of whole nuts still in their shells – nuts in their natural state without added salt and sugar (yes I love dry roasted peanuts and honey roasted cashews too!) are by far the healthier option. Plus the effort required to crack those shells and pick out the nuts will slow down the rate you get through them and you may not eat so many! A great source of Calcium (particularly of you are not having much dairy) and Vitamin E, almonds are not as calorific as some nuts and contain relatively little saturated fat. They are rich in protein and fibre so are likely to help you with snacking control as a little will go a long way in satisfying your appetite. Try to avoid the sugar coated ones you get at Christmas time though! Rich in Selenium, Brazil nuts are great for supporting your immune system and also great for the boys – selenium is essential to support sperm production and boost fertility. You only need 3-4 a day to meet your entire day’s requirement! Being higher in total fat and saturated fat than most other nuts, don’t go too mad with these! Little and often is far better than bingeing on nuts at the weekend and go easy on those nice chocolate covered ones you are given as a present! Did you know cashew nuts look like this on a tree? You will never see cashews still in their shells because they are toxic so always removed. Cashews are one of the lowest calorie nuts so can be a good choice as a satisfying nibble or snack. They are relatively rich in saturated fat however, so watch how many you have if you have are keeping an eye on your cholesterol levels. These nuts are also great thrown into stir-fries to add extra protein to vegetarian dishes. These are the nut with the lowest fat and calories by far. They have less protein but are rich in starchy carbohydrates and fibre so can make a great satisfying nibble. They are also rich in B vitamins (B3) which is great in helping to release energy from other foods and B6 which can help balance hormones. You simply can’t beat the feeling of peeling off the skins from a roasting hot chestnut on a cold day! Of course these go hand-in-hand with chocolate (I know I’m not helping but thinking Nutella and Ferrero Rocher….) but studies have shown that hazelnut enriched diets (with just plain hazelnuts) helped lower the level of ‘bad’ cholesterol (LDL) in the blood whilst raising the level of ‘good’ (HDL) cholesterol. Hazelnuts are a good source of Vitamin E, B6 again, and for B1 (Thiamine) which is also needed to metabolise energy in the body. These have the highest fat and calorie content (around 200Cal / handful) so go easy on them. To a certain extent this is counteracted by their rich Monounsaturated fat content (also found in olive oil) which has beneficial effects on heart and blood vessel health. They are also a good source of fibre as well as magnesium, calcium and potassium too. Peanuts are rich in mono-unsaturated fats again and also rich in antioxidants. One of particular interest is p-coumaric acid – researchers discovered that roasting peanuts can increase the level of this antioxidant by ~20% – as much as we find in some fruits! Peanuts are most commonly sold salted – try to limit your intake of salted nuts (and those chocolate covered ones too!) and go for the raw or plain roasted nuts instead. Roasted nuts are so full of flavour! Could a handful of pecans keep the doctor away? Pecans are extremely rich in beta-sitosterol; a type of plant sterol that have the ability to lower cholesterol levels as they compete with dietary cholesterol, preventing its absorption in the gut. Pecans are rich in antioxidants too that can help protect the heart from disease (atherosclerosis) associated with heart disease . Like macadamia nuts, pecans contain plenty of mono-unsaturated fatty acids which also help protect the heart. Pecans included in christmas cake, christmas pudding, pecan pie and mince pies do not really count towards your small-handfull-a-day! Pistachios have to be roasted in order to open up the shells so we can get the nut out. I was once asked if it was dangerous to eat an unopened pistachio nut – it certainly is safe but good luck to you if you can break it! Pistachios are nothing like mussels (which you certainly shouldn’t eat if still closed). Pistachio’s are the only nut to contain reasonable levels of lutein and zeaxanthin, two antioxidants that play an important role in protecting the eyes. They are also rich in vitamin B6, so can be a good choice for women as a snack around the time of your period. 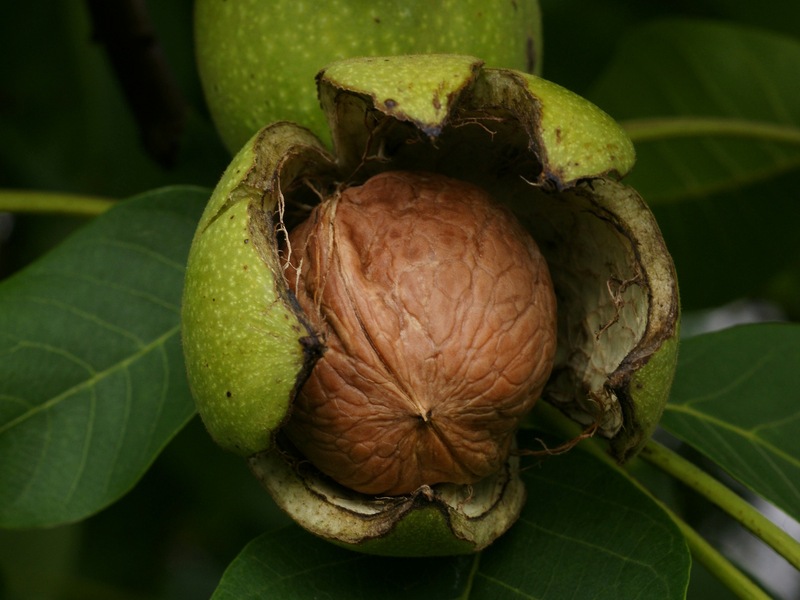 Walnuts contain the most omega-3 fats of all the nuts – this makes them a valuable alternative to oily fish if you don’t eat / like it. Like many other nuts, they are a good source of mono-unsaturated, heart-friendly fats and studies have shown they can help to lower the levels of LDL. Lastly walnuts are rich in tryptophan – this is an amino acid that can help you fall asleep so pick this nut if you have trouble dropping off at night. So in summary the nuts lowest in saturated fat are almonds, chestnuts and hazelnuts. Watch how many you have if you are nibbling on Brazils, Macadamias or cashews as these contain the most saturated fats. Only buy the nuts with the highest fat content in small batches – Brazils, Macadamias, Pecans and Walnuts, as they are more likely to go off (rancid). Never eat a nut that tastes ‘off’. Brazils, peanuts and pistachios are at most risk of being contaminated with mould that produce chemicals called aflatoxins – these can make you very unwell. As I am sure you know, nuts are very moreish, especially when accompanied with a nice drink. Try putting a small handful in your own bowl and nibbling on those rather diving into to the bag when you want some more – you are more likely to lose track of how many you have if you do this. Try mixing raw and plain roasted nuts with a selection of dried fruits to make a tasty and healthy nibble.Supermarkets often sell unsalted / non-coated nuts in their ‘wholefood’ aisle but healthfood shops often have a better selection. You could make your own trail mix by adding your favourite nuts seeds and dried fruits together in a Tupperware container – try a mix of cashew nuts, walnuts, almonds, pumpkin seeds, dried cranberries, golden raisins and dried pineapple. Have you fallen off the vegetarian wagon?